"Jason Rusch and Ronnie Raymond are two high school students, worlds apart – and now they’re drawn into a conspiracy of super science that bonds them forever in a way they can’t explain or control." I was looking forward to a Firestorm relaunch in the wake of Brightest Day, but based on the above image, I might be having second thoughts. First, the pedigree: Gail Simone? Win. I loved her work on Wonder Woman and have heard good things about Secret Six, although I must confess I haven't really read more than one or two issues. Ethan Van Sciver? It looks like he's doing covers, but I've heard elsewhere he's also contributing to the stories. I love his artwork but I've never seen him write a series that I know of. Still, so far so good. Yildiray Cinar? Definitely a win. I saw his artwork at his New York Comic Con booth last year and to say it was stunning was an understatement. The guy's definitely got talent. His work is very dynamic and I've been waiting to see him on a project I'm interested in. Now, for the doubts...and you should see three big ones on the top of the page. Three ugly, ugly costumes for Firestorm--two of which share a Flash/Reverse Flash motif. 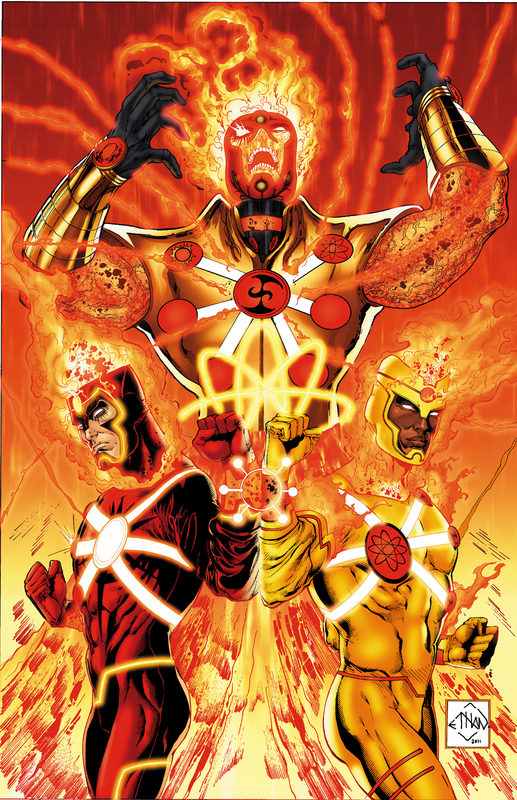 Apparently either Jason and Ronnie are both able to form a kind of Firestorm variant on their own, or else similar to Brightest Day their appearance changes depending on who's in control. And what's that Firestorm character above them both? A kind of uber-Firestorm? Is it some kind of living version of the matrix that was hinted back in Brightest Day? Or something else? I'm ambivalent about regressing Ronnie Raymond and Jason Rusch to both being teenagers. Are there good stories that could be told with this paradigm? Probably. Are they going to tell a new origin in the first issue? Is the "countdown" referred to in Brightest Day #24 going to occur? At this point, who can say? Ah, plenty of questions....and, a few fugly costumes. First thing I noticed: Jason’s emblem fills one of the 6 circles on the “Mega-Firestorm’s”(?) chest. 4 are blank and one looks like the LSH’s Sun Boy logo. Ronnie doesn’t seem to have a logo, but the Sun could be his. Does this mean that up to 6 people could form the new Matrix? I'm just hoping that, since this seems to be a complete reboot of the character, Stein is alive and well somewhere. Interesting....also check the wrists on the Uber Firestorm. 2 more empty circles. I need to look in to this book.